(Wenham MA) No surprise here. 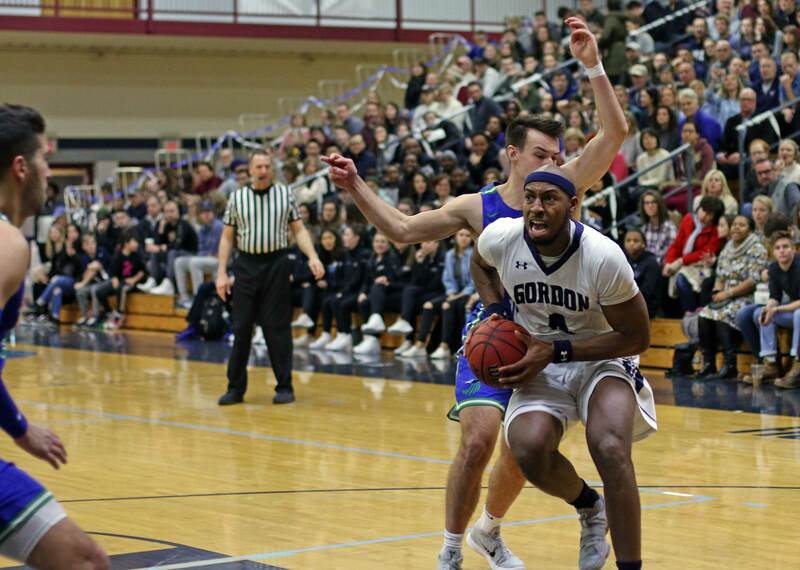 Gordon advanced to the Commonwealth Coast Conference semi-finals after a 99-85 win over Salve Regina on Tuesday night at the Bennett Center. This was the third victory over the Seahawks this season. Pattern has been similar each time: Gordon gets a big lead, Salve narrows the lead but doesn’t have enough offense to get things to the dicey level. The beauty of this game (to me) was the balanced scoring. There were six Scots in double figures. 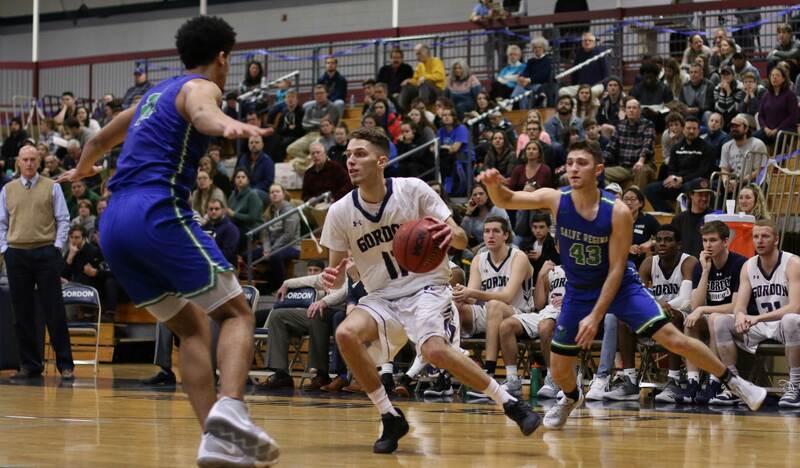 Usually the two first-team All-CCC’ers (Garrisson Duvivier and Eric Demers) get there with an occasional 3rd player joining them. 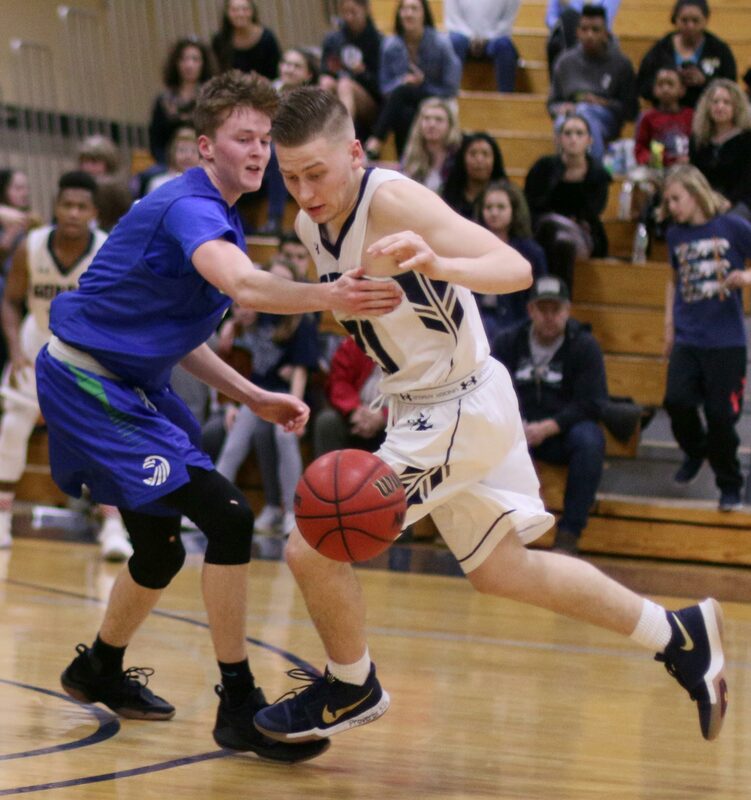 Tonight, every starter got there, and reserve Noah Szilagyi added ten points. 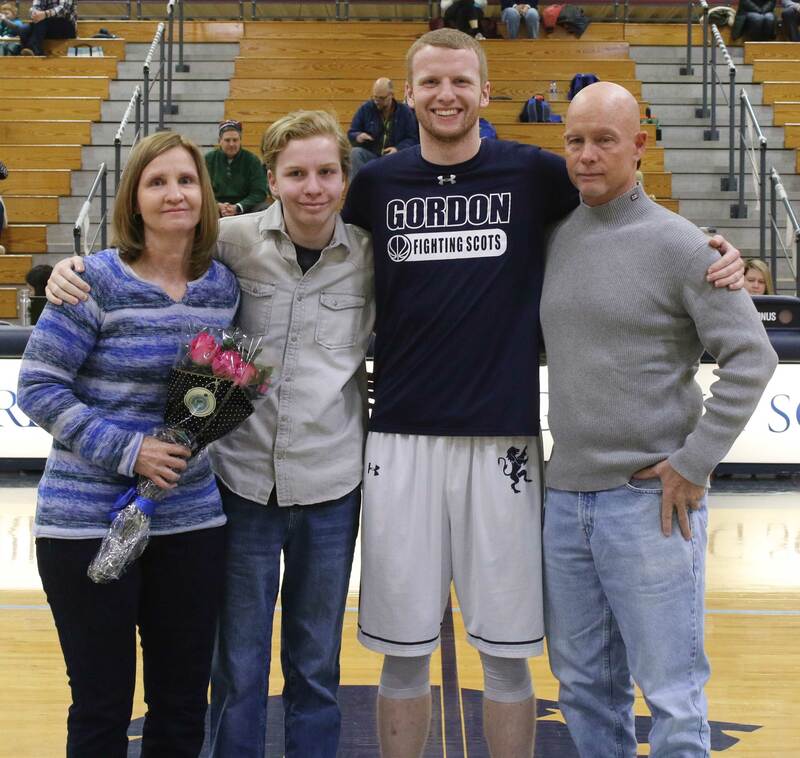 The one they were talking about afterwards was junior Jake Haar. 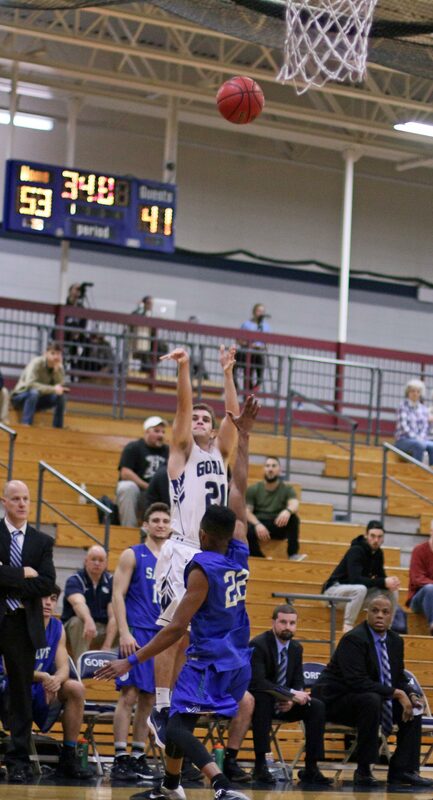 You watch enough GC games and you have seen “The Iceman” drain three’s. Nothing like tonight, however. Jake was six-for-seven from long range. 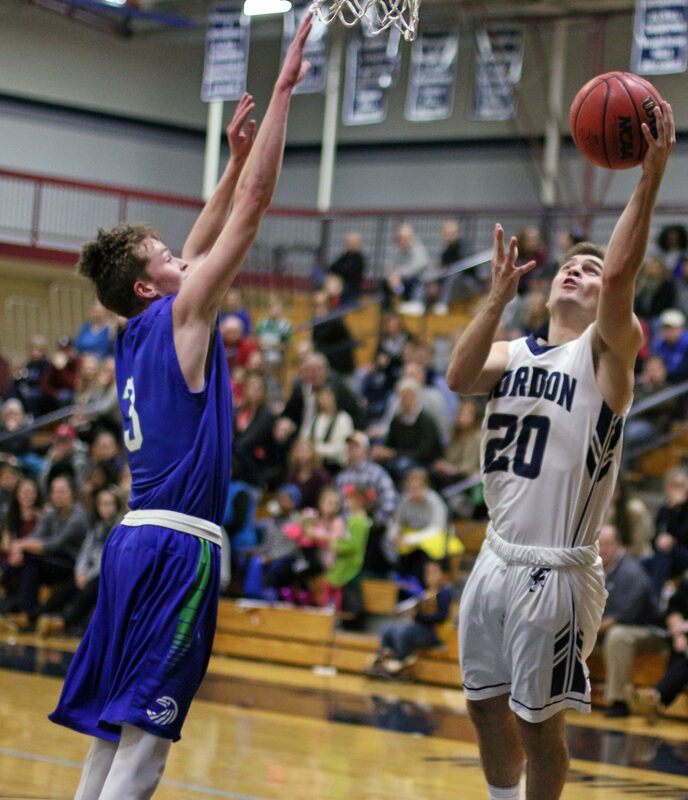 “When the Iceman has it going, if you’re not right up in his shirt, he’s going to hit the shot,” said Coach Murphy. I’ll call this Jake’s best game. He put up twenty points, missing only one shot, and added four assists. Gordon (18-8) gained separation late in the first half. A 36-34 lead bulged to 47-34 in less than three minutes. 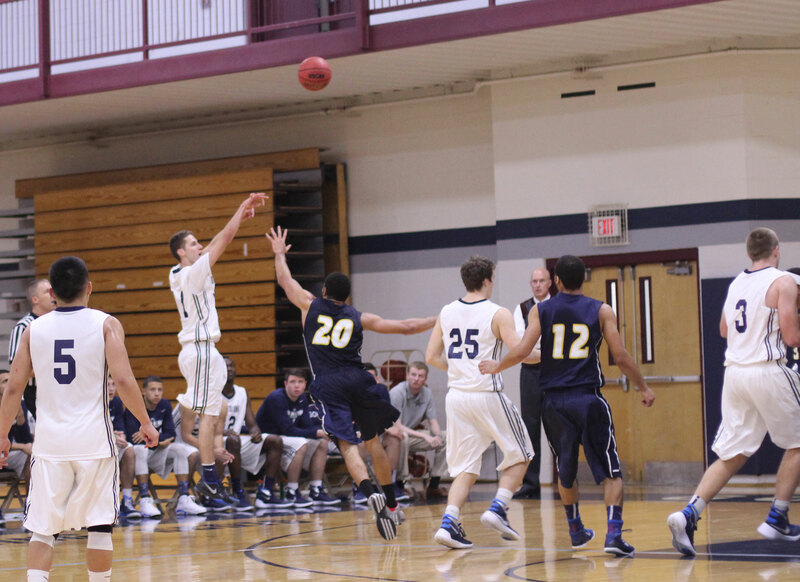 The Scots had four baskets in the breakaway run and ALL of them were assisted. That’s called, finding your teammates. 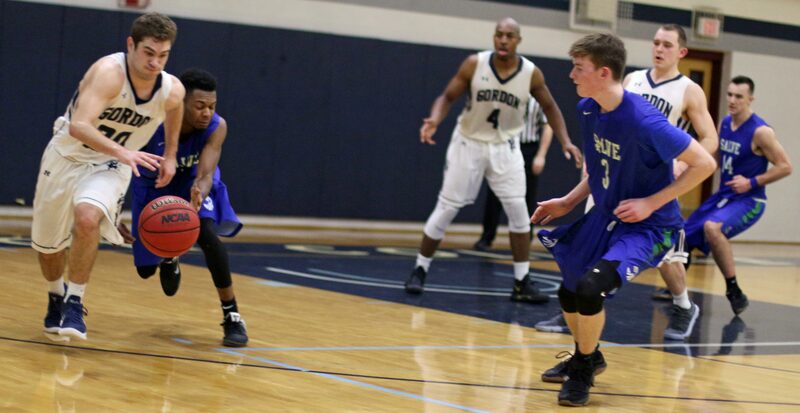 On the night, GC had twenty-four assisted baskets and ONLY ten turnovers. You win games with those numbers! In the second half, you knew it would happen. What? 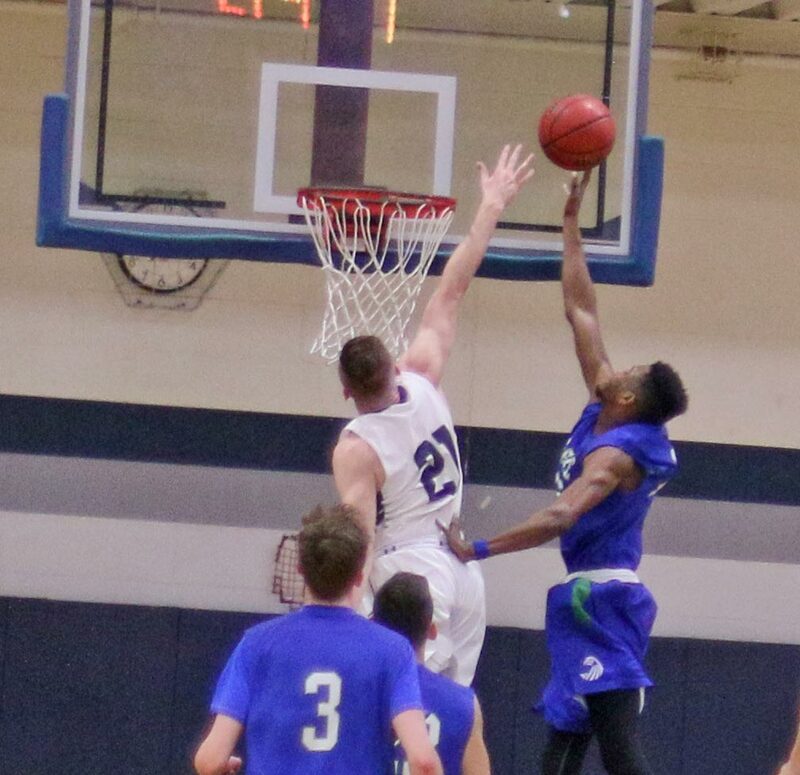 The lead got big (twenty points) and then SR, led by Rodney Morton (28 points) cut into it. With seven minutes left, the Gordon lead was 83-69. Coach Murphy called a timeout, and those paying attention, heard his “outdoor” voice. No doubt the team caught it loud and clear. The next 2+ minutes GC turned to layups and free throws and pushed things to the safety zone (93-72). The Scots shot over 60% in the first half. “Offensively we were unbelievable in the first half,” said Coach Murphy. Garrisson Duvivier turned in his 18th Double D of this season. He added five assists. 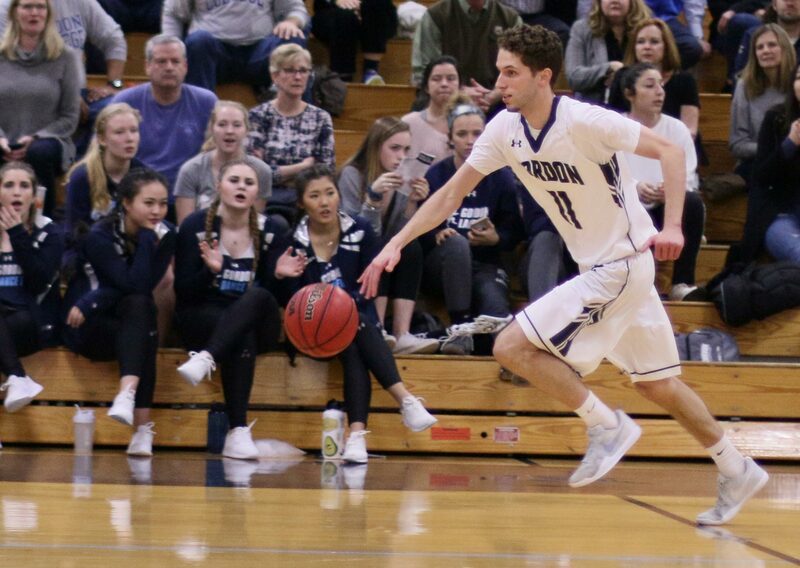 The immeasurable stat would be the number of shots opponents don’t take close to the basket because GD is lurking ready to hand out a rejection. 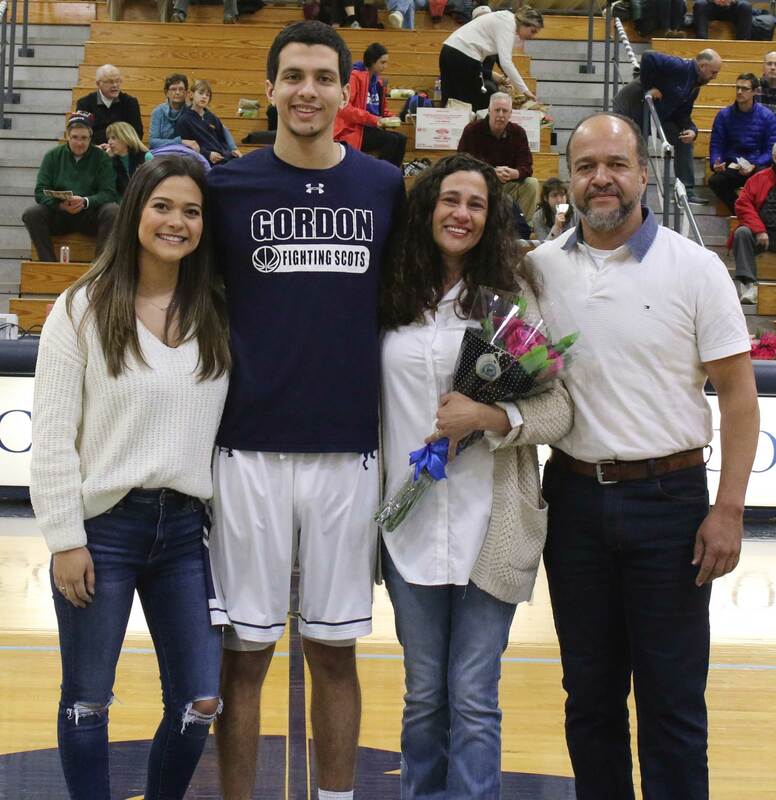 Next for Gordon will be Endicott at the Bennett Center (7PM) on Thursday night. 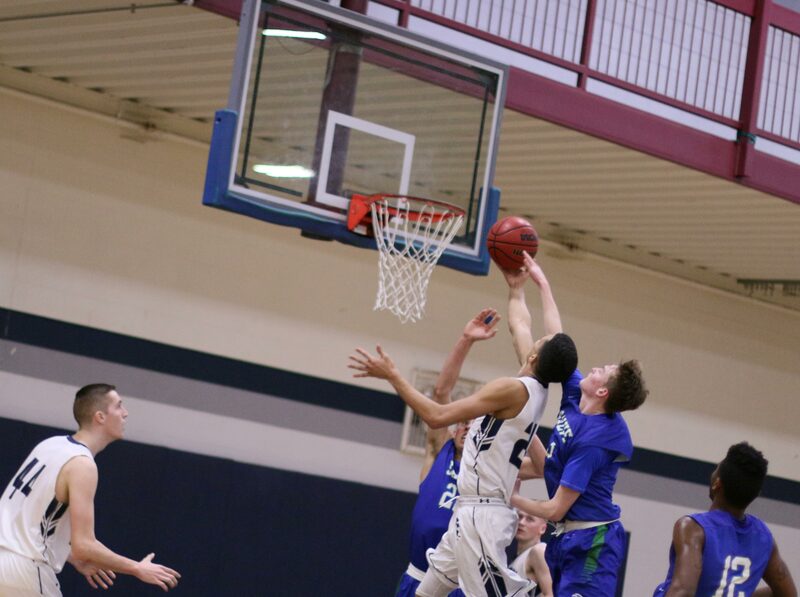 The Scots have beaten EC twice this season but both games were tight. “Anytime you can play a great team that is your cross-town rival in a big game it’s fun,” said Coach Murphy. I have to confess that “fun” isn’t the first thing I think of when we face the Gulls! I think of Yankees/Red Sox where wins are exhilarating, and losses hurt for days. To each his own on that one! The bleachers were pulled out at the Bennett Center for this game. The crowd was underwhelming in my opinion. That should not be the case on Thursday night. Playing/Beating Endicott is a happening! (Amesbury MA) Now it’s time for the reason you lace them up……The Commonwealth Coast Conference Tournament. 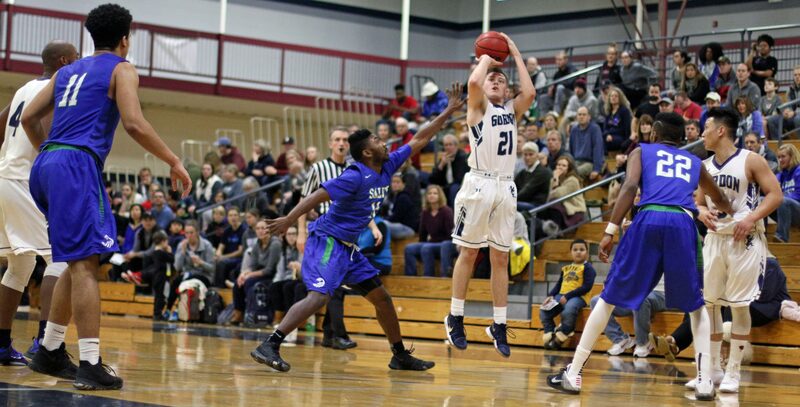 The Scots (17-8) finished the regular season with a didn’t-matter win (80-67) over Salve Regina on Saturday afternoon. 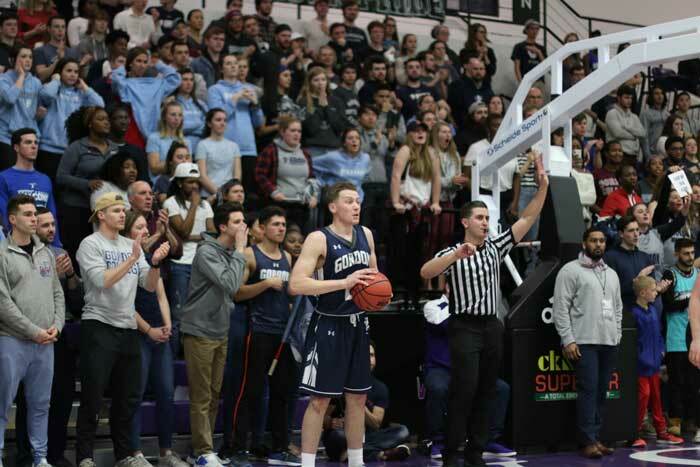 But it did matter because on Tuesday night (7PM) at the Bennett Center the same two teams will face each other in the CCC quarter-finals. 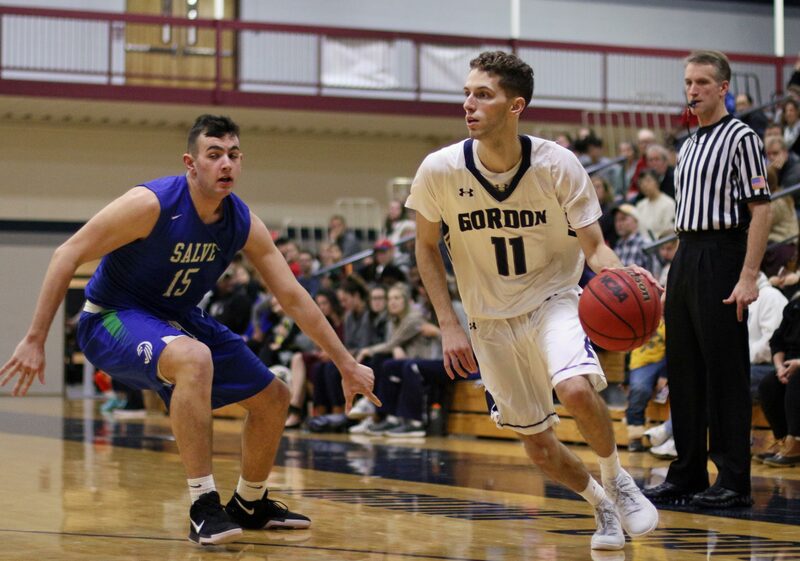 Gordon is the #2 seed (13-5) while Salve Regina (7-11) is the 7th seed. They say that “familiarity breeds contempt” but after seeing the Seahawks twice, I’m afraid that familiarity might breed over-confidence. 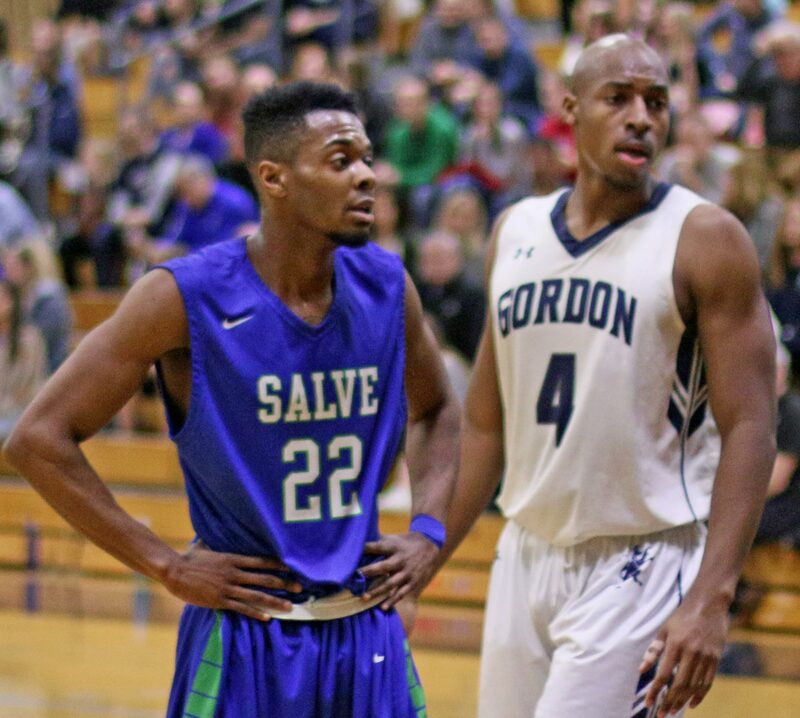 Salve (10-15) has not played well against Gordon in either game. 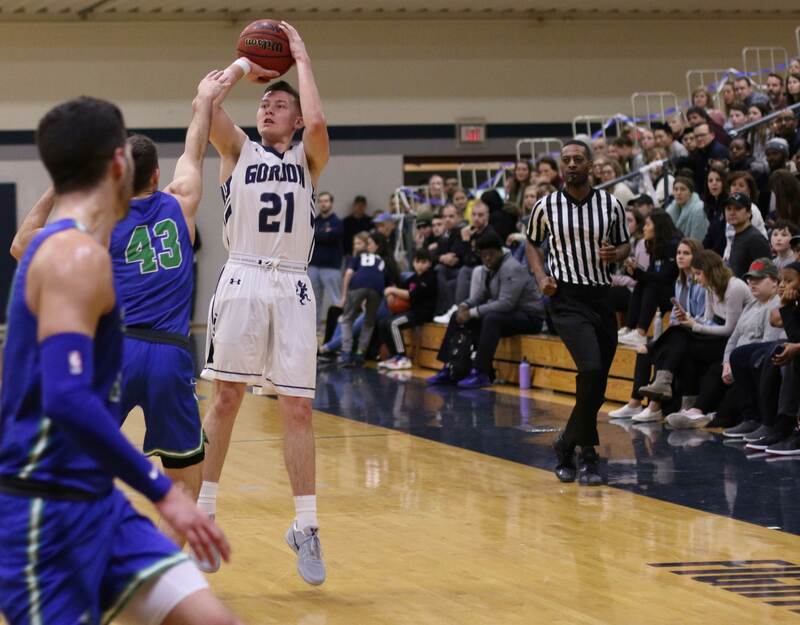 In both games their first-half lack of accurate shooting has put them down by double figures and they have been unable to rally to put late-game pressure on GC. But one thing that the Seahawks have been able to do is hang around. They’ve now done it twice. They get down, but they never allow the game to reach the bench-clearing level until the last minute or two. 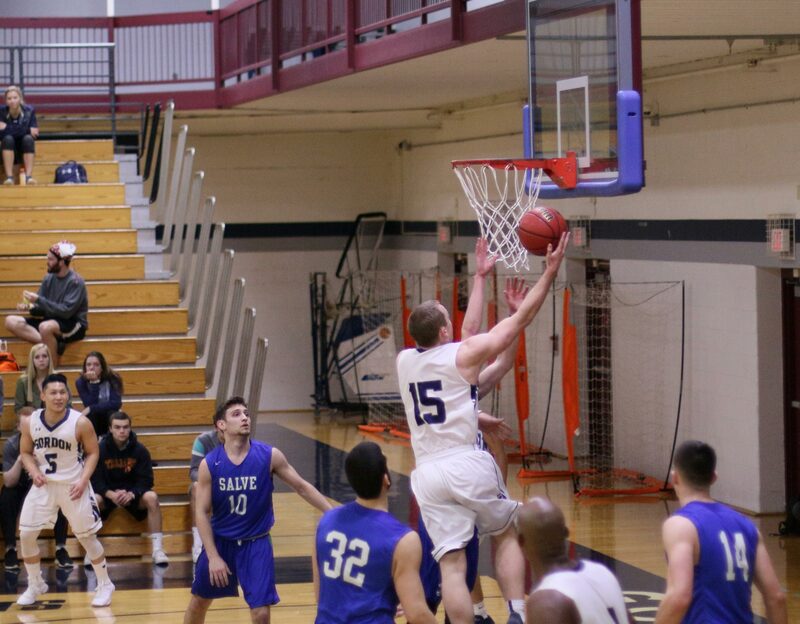 Salve defeated Endicott a few days ago. They are dangerous even if we haven’t seen that side of them. May it not happen on Tuesday night. A win or loss in today’s game was not going to change the tournament seedings for either team. So you had to take today’s game with that in mind. 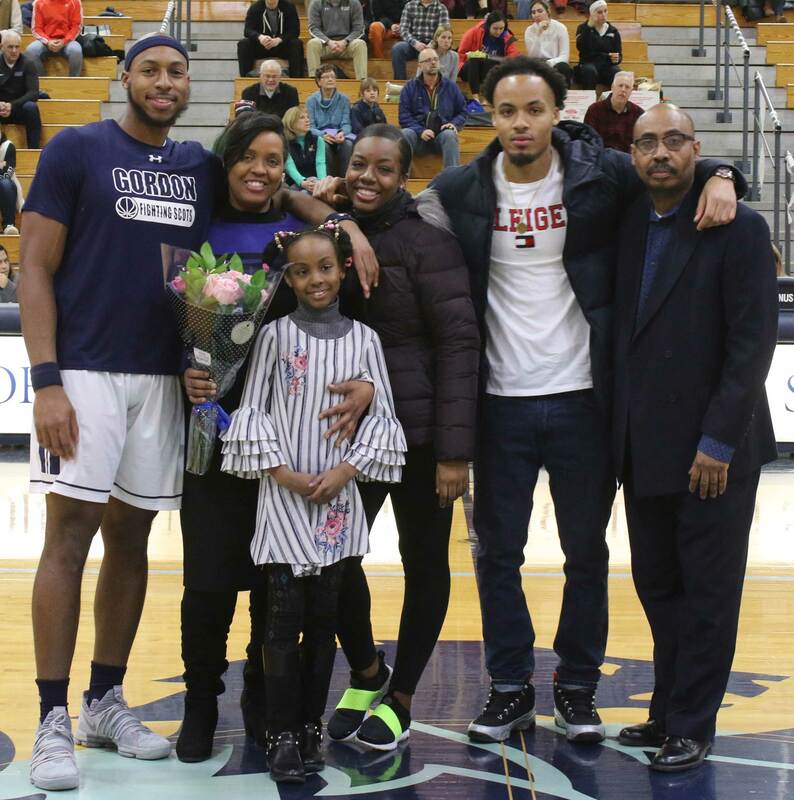 One thing that was certain right away was that SR’s lone senior (Rodney Morton) was going to take a lot of shots and score plenty of points…and he did. Rodney finished with 27 for the afternoon even with a 1-for-10 from long range. 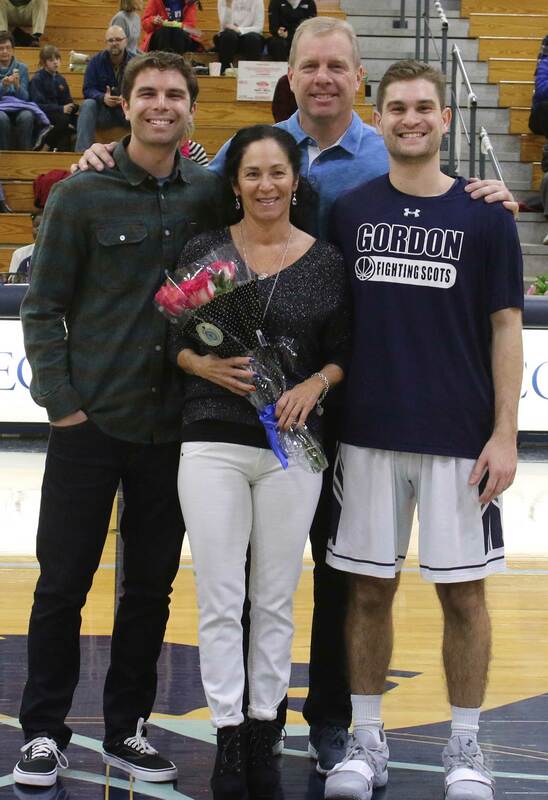 Sorry Rodney, the best senior on the floor was Gordon’s Jake Hart. You talk about putting everything together in one game! Jake matched his career high in points (16) and never missed a shot. 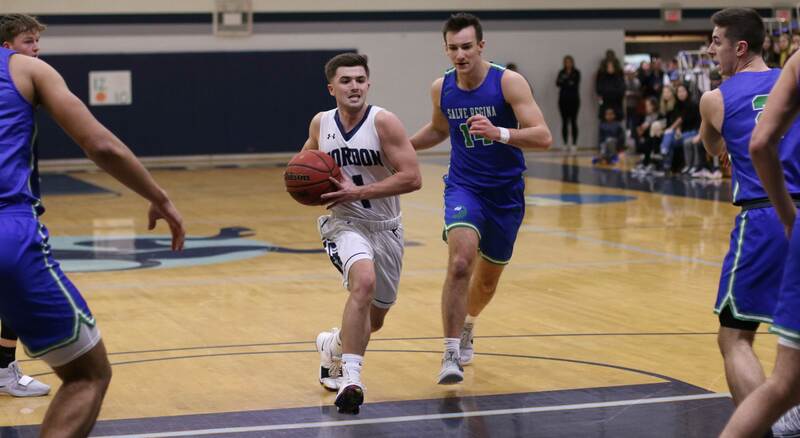 Last time I checked Jake was listed at 5-11 but that may be a typo as he landed seven rebounds including four offensive ones. Add on two assists and three steals and you’ve had yourself a ballgame. The breakaway segment came in the last five minutes of the first half when Gordon expanded a 25-23 lead to a 44-32 advantage. 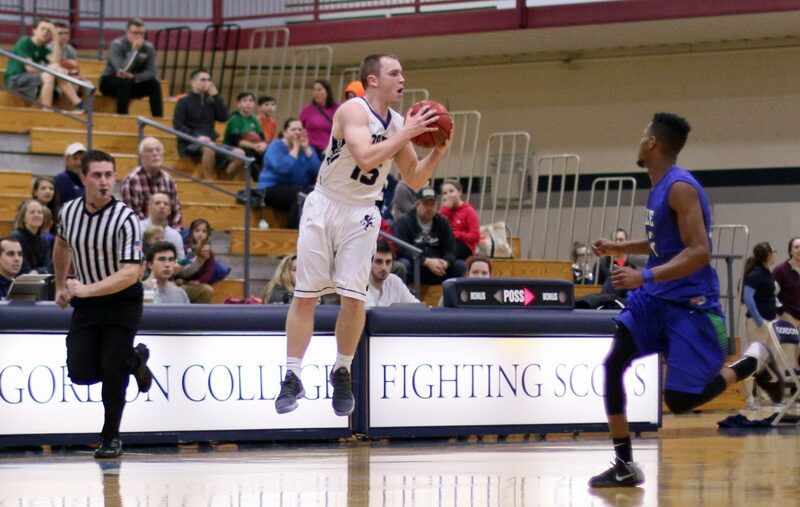 Eric Demers (16 points) had three of his four 3-pointers during that closing spurt. 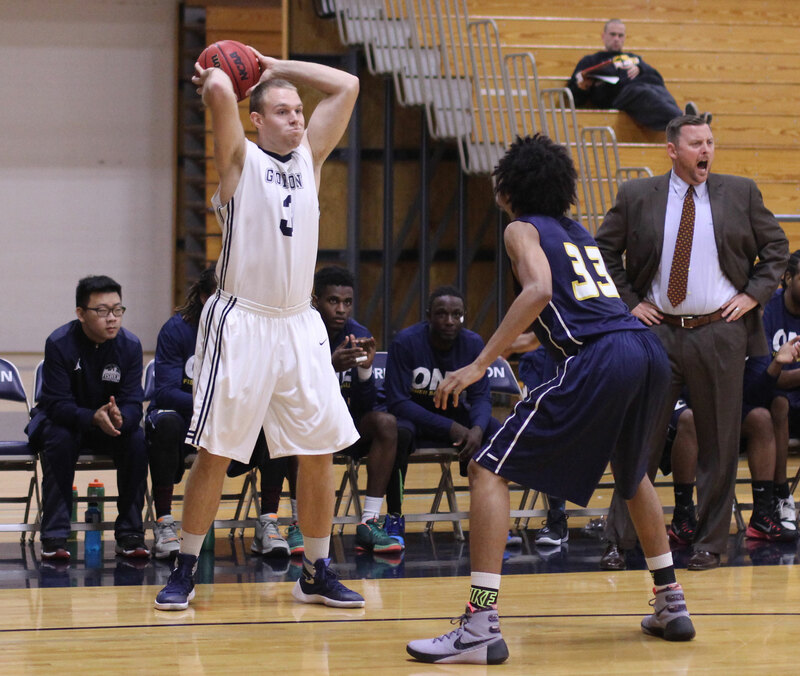 Garrisson Duvivier (13 points) collected eleven points from the foul line and added thirteen rebounds. We waited almost four years for this to happen but it did happen in the closing seconds: Steven Vampatella put himself in the scoring column. Nice pass from fellow senior. Steven lifted his defender with an up-fake and dropped in two from the right. Bench went nuts! Eric had twenty-six last time against SR.
Two postgame concerns; (1) inability to put an opponent away and (2) the boatload of turnovers. If GC plays three more CCC games, they will all be against teams capable of putting points together. I suspect that our team will have few chances to gain separation. Must take advantage of the opportunities. Turnovers: Am I the only one troubled by them? If the Scots had twenty-five turnovers in the first game of the season it might be understandable, but to get that season-high total in the LAST game of the regular season is disconcerting. 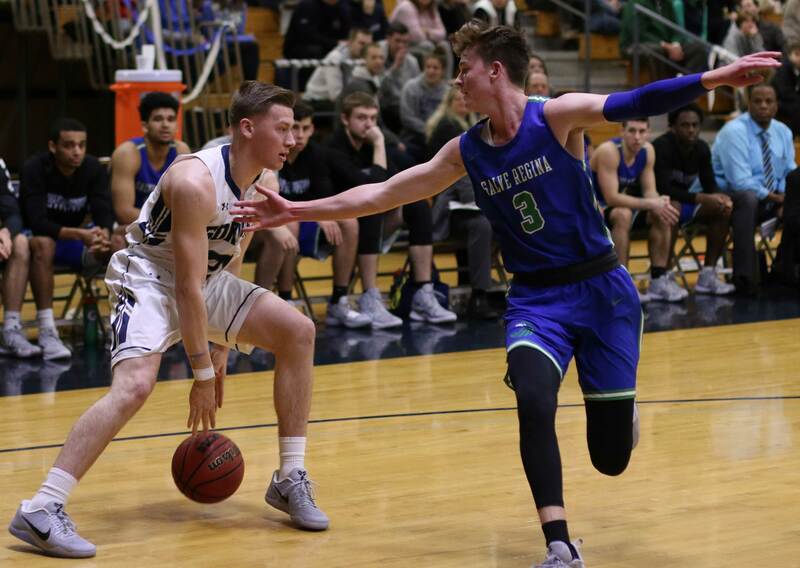 SR often double-teamed dribblers and defensive rebounders. Why not anticipate this and quickly outlet the ball to an open teammate? Layups and/or open shots often result. I know, the team won, lighten up! It’s just that I want to be writing about something realllly good next Saturday. I don’t want to be looking for reasons why GC lost. (Wenham MA) We’re starting to get spoiled. 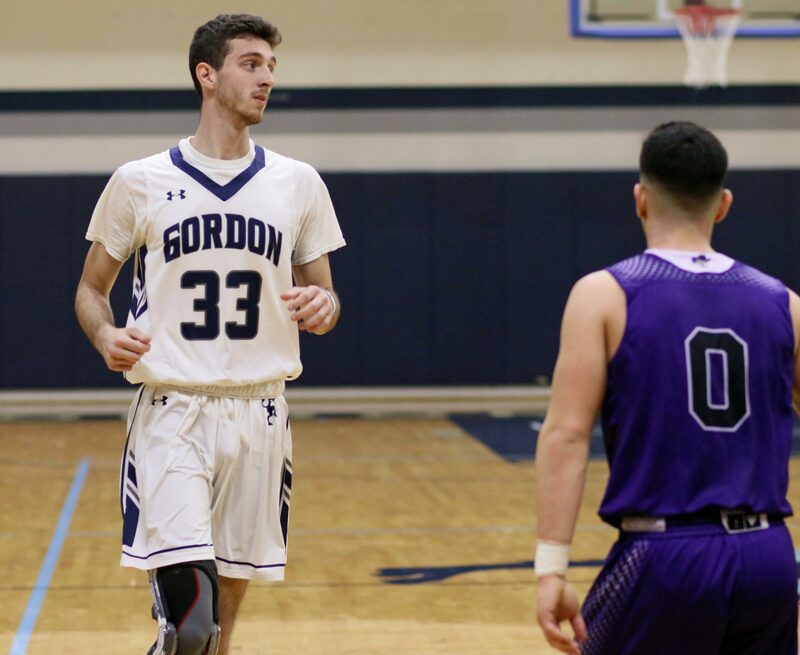 Gordon (9-5) ran its winning streak to five as they defeated Salve Regina, 81-66, on Saturday afternoon at the Bennett Center. 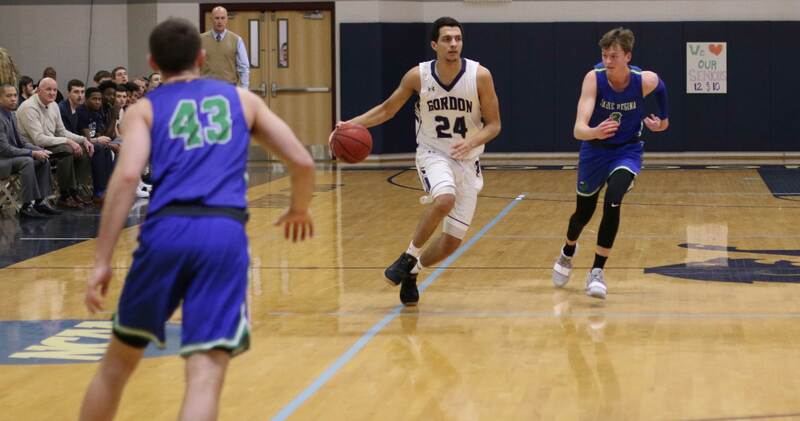 The coming week looms large for the Scots with consecutive CCC road games against Roger Williams, Western New England, and Curry. 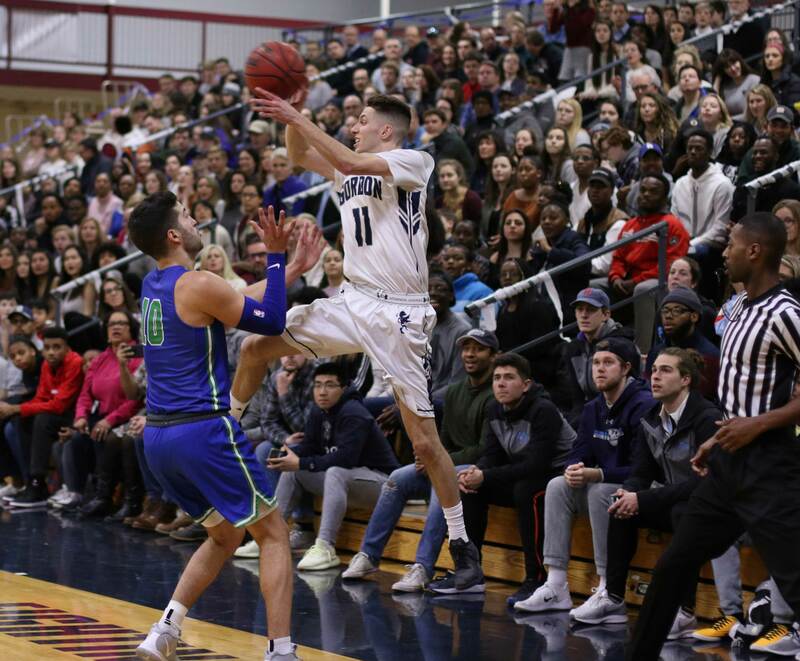 After losing their first two Commonwealth Coast Conference games, the Scots are on a five-game league win streak and just one game away from the top spot. 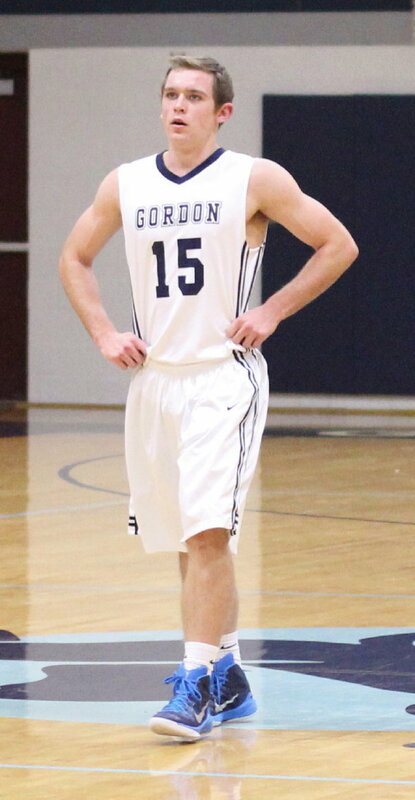 Gordon jumped all over the visiting Seahawks (6-9) in the first half leading by as many as twenty-eight points. There was a sense that the lead would grow enough in the second half to turn this into a bench-clearing event. 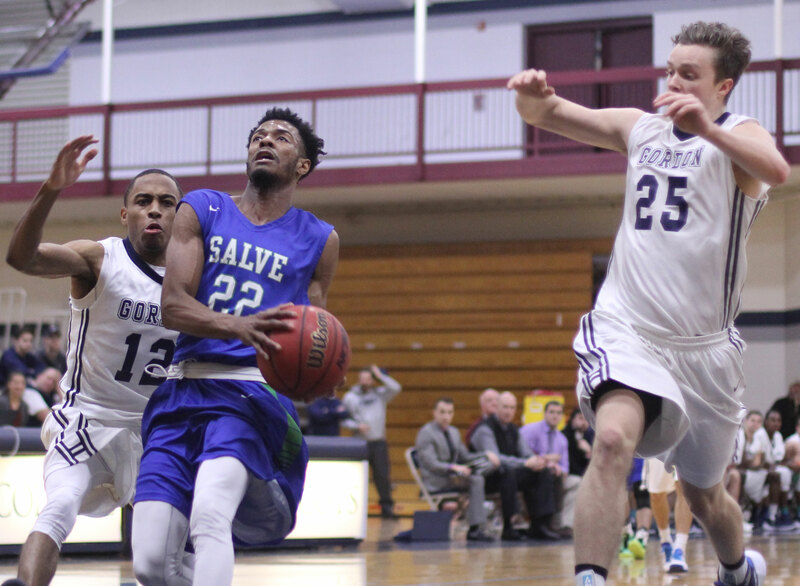 Understand that Salve (6-9) never got within double digits of the lead, but they spent most of the second half hovering too close for GC comfort. There was a bigger picture, however, and that was to continue to get W’s. “I would rather win ugly than lose ugly,” conceded Coach Murphy. 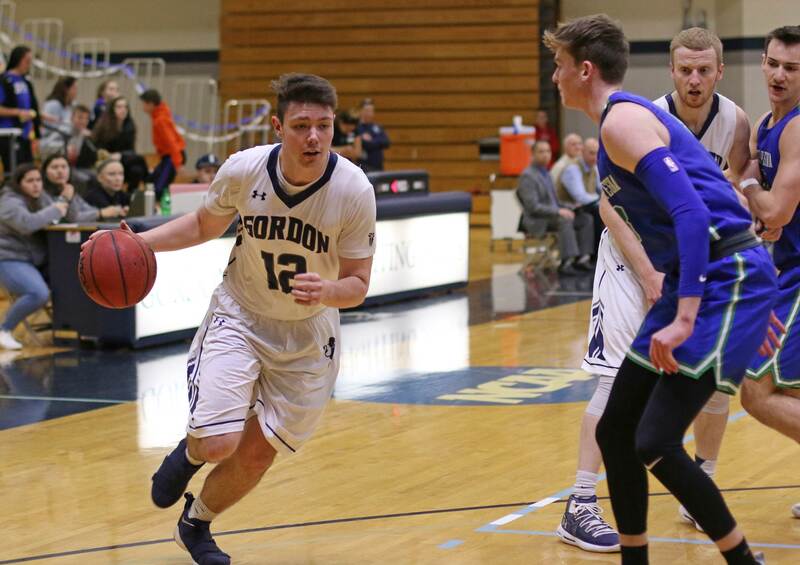 Gordon’s big first half did in Salve. In a tight game for four minutes (10-8), the home team went on a 31-5 tear over the next thirteen minutes to escape 41-13. The Seahawks never recovered. “Coaches look like they’re really smart when the team is hitting shots, and early on we hit a lot of shots,” said Coach Murphy. Even with the team letdown in the second half, Eric Demers, Garrisson Duvivier, and Jaren Yang had terrific afternoons. Eric continues to put up serious numbers, getting over twenty points for the 9th time this season. Teams have tried guarding him closely and even have attempted to deny him the ball, but he still finds openings. His ability, this year, to cut back on the turnovers while handing out assists and adding steals has been noticeable. 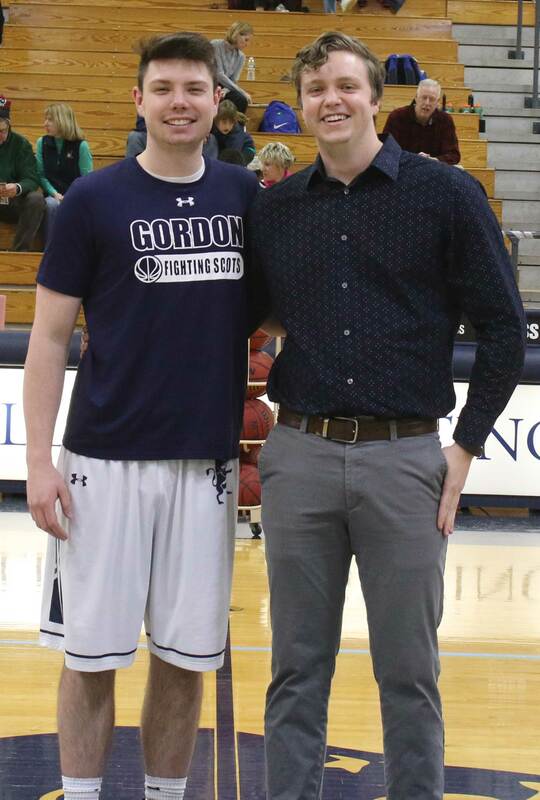 Garrisson has impacted the GC program since the day he arrived in 2015. He puts up double/double’s with regularity including this afternoon when he put nineteen points together with fifteen rebounds. It was his 9th double D this season. 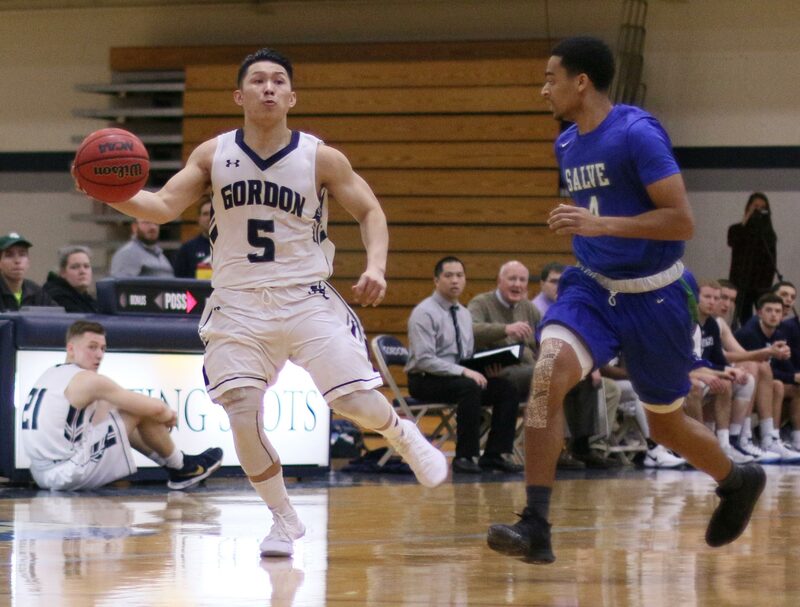 Senior Jaren Yang may well have had the best game of his Gordon career this afternoon. Accurate outside shooting (4-for-6) and perfect foul shooting (6-for-6), along with a good eye for the open teammate (8 assists) will get you a very good day. 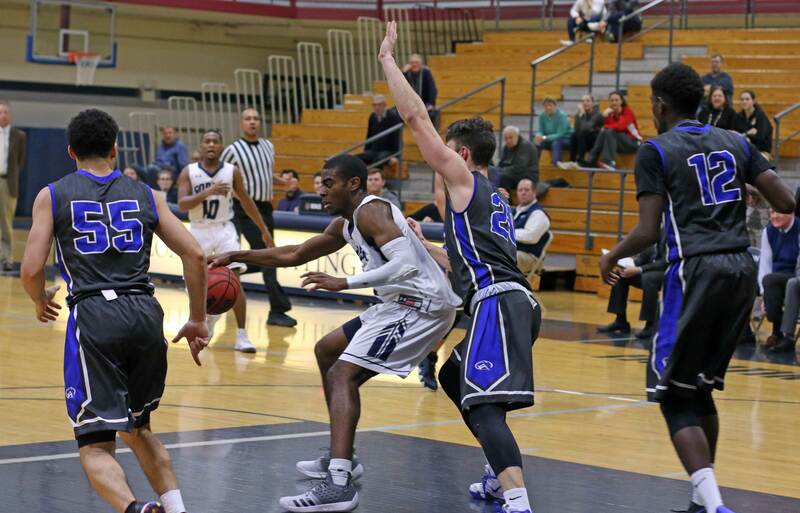 Jaren reached the career-game level, however, when he added four steals to his totals. So you can see that was plenty of good individual moments despite the margin-squandering moments of the second half. The magic margin number in the second half seemed to be twelve. 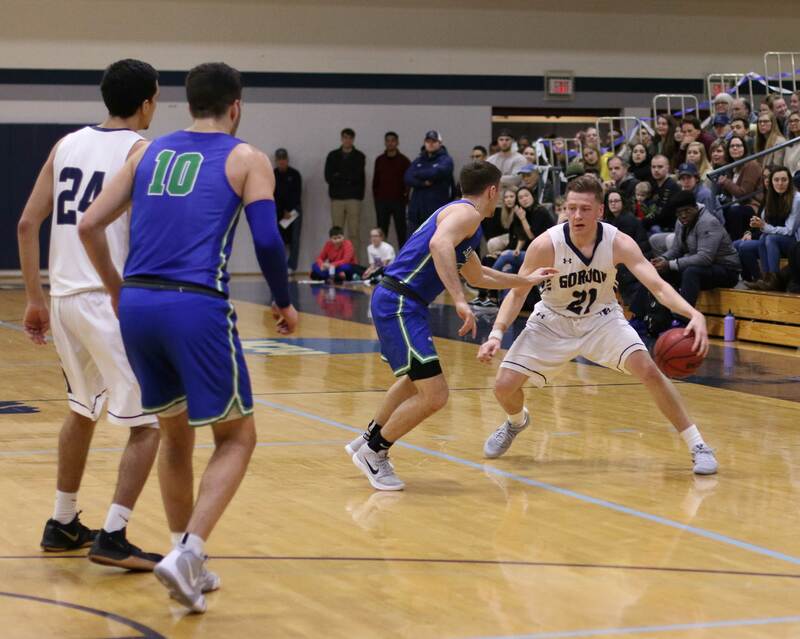 Six times in that second half the better defending and better shooting Seahawks lessened their deficit to twelve. And every time this happened, the Scots were able to react with enough offense/defense to re-enlarge their advantage. 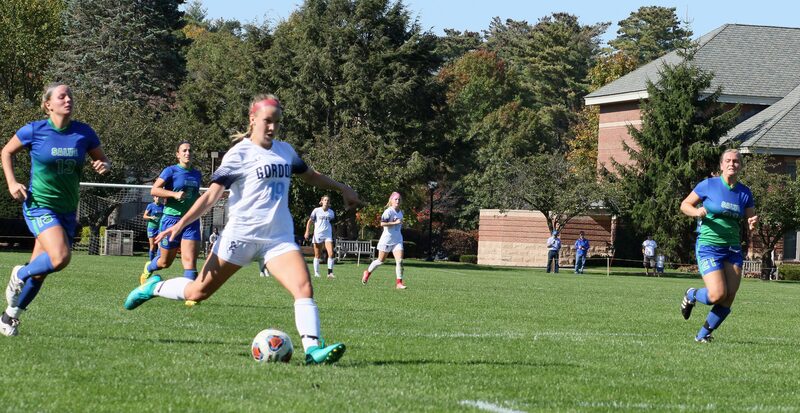 (Wenham MA) Gordon put short passes together all game long but most of them were horizontal. 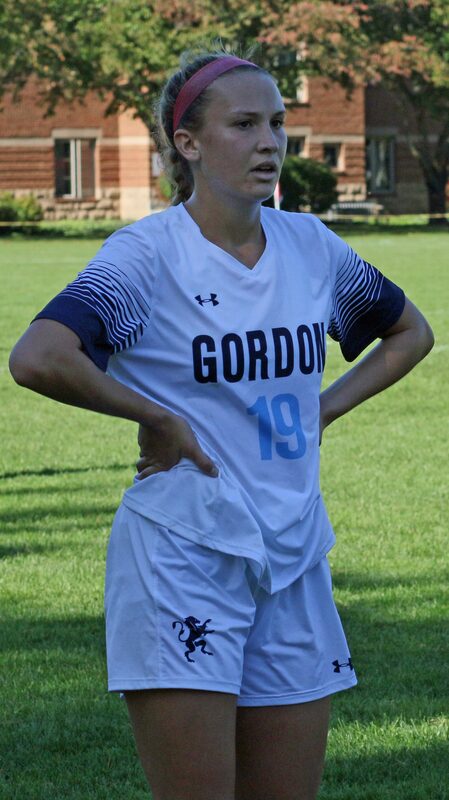 However, ten minutes into the second half the Scots (8-4-2) put two vertical passes together and sophomore Lexi Potter broke in with the second one netting the only goal of the game. The 1-0 victory over Salve Regina (5-9-3) extends the Scots win-streak to four with one game left in the regular season. The Commonwealth Coast Conference tournament is scheduled to start next Saturday. 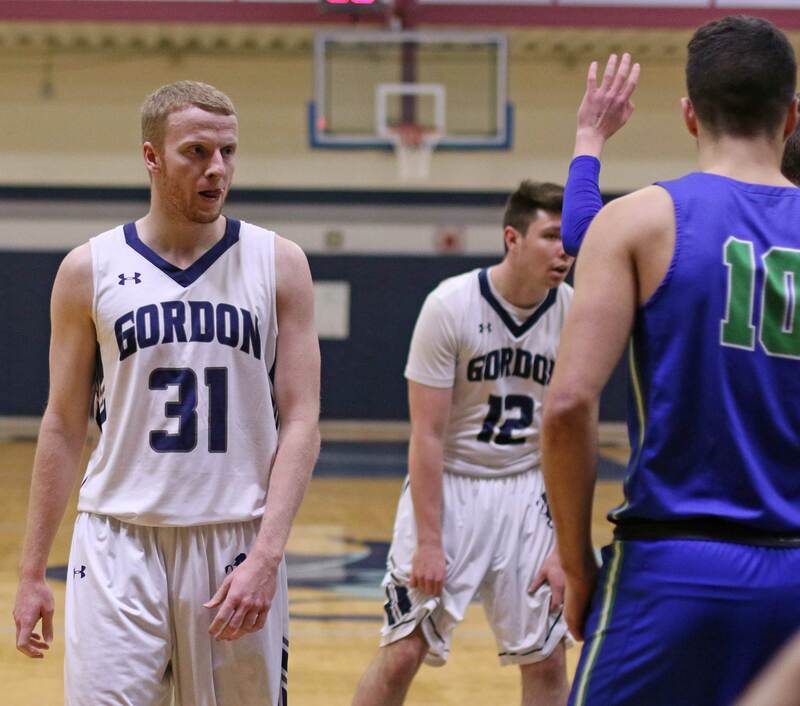 Gordon, at 5-2-1 in the CCC, might face Salve again in the first round. GC is currently the #4 seed. 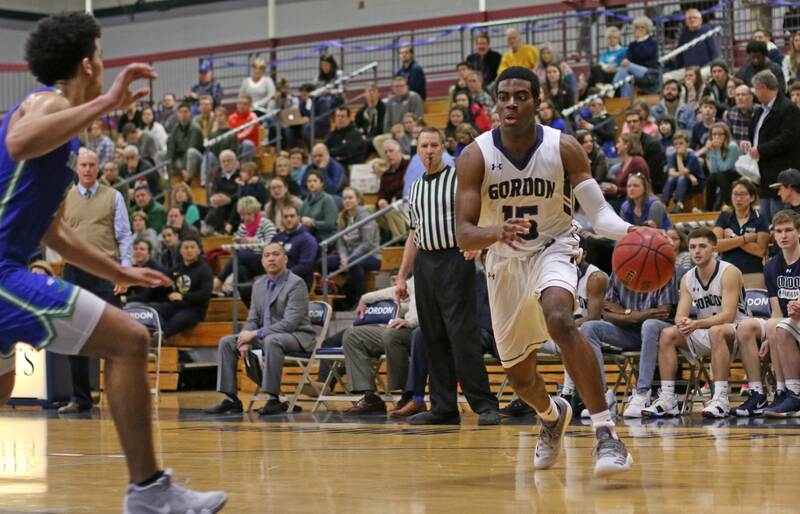 If Gordon can remain in the top four of the CCC they will earn for themselves a first-round home game. That would be a good thing because the Scots are undefeated (5-0) on the Wenham campus this season. This was my first look at the women’s soccer team. I was immediately impressed with their determination and ability to keep possession of the ball for as long as possible. They forced the visitors from Newport (RI) to do a lot of chasing. 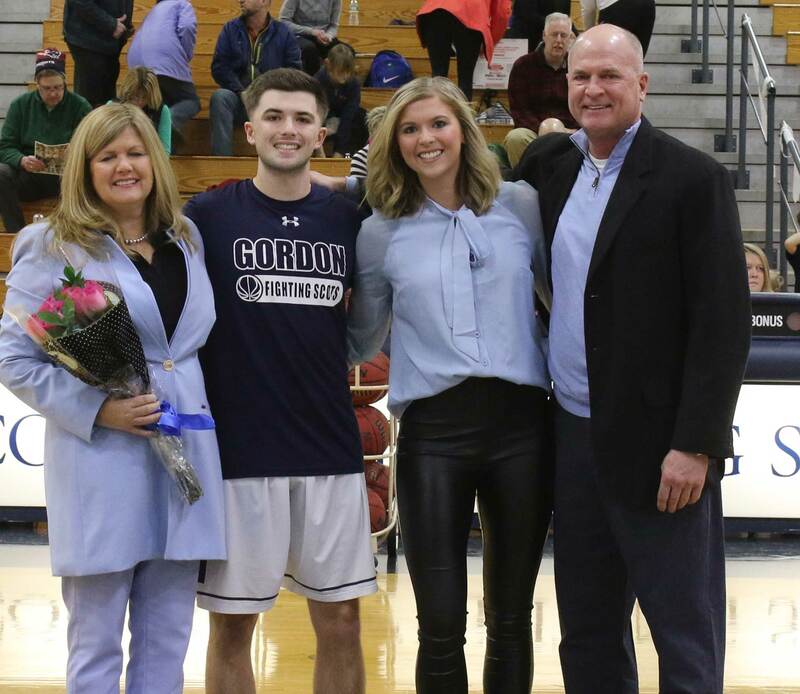 The GC seniors (Kay Silveira, Naomi Shearer, Kim Bowley, Chandler Stier, and Sammi Morren) and their parents were recognized in a pregame ceremony. 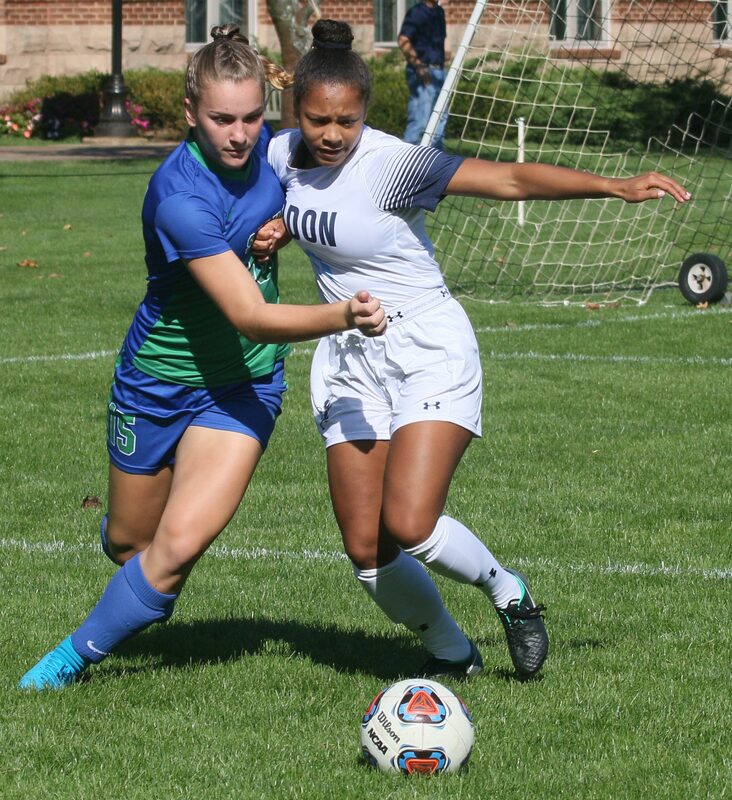 Later, Naomi would make a huge play in the game sliding across in front of SR’s Abby McMackin to block a high-percentage shot attempt. 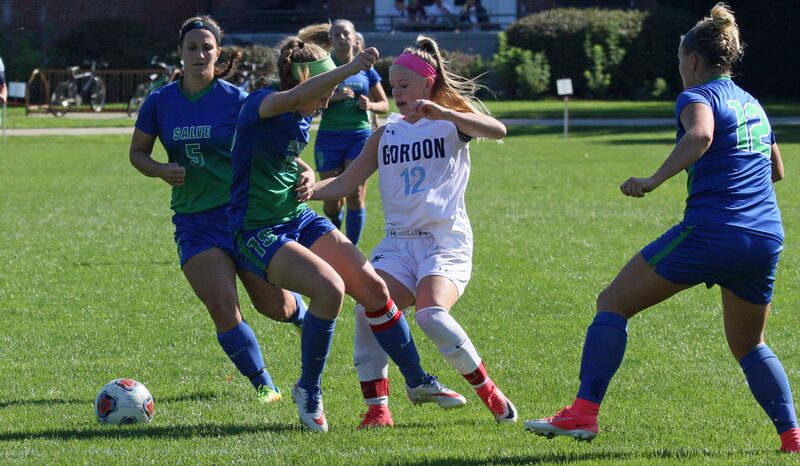 Abby has a team-high eleven goals this season for the Seahawks. 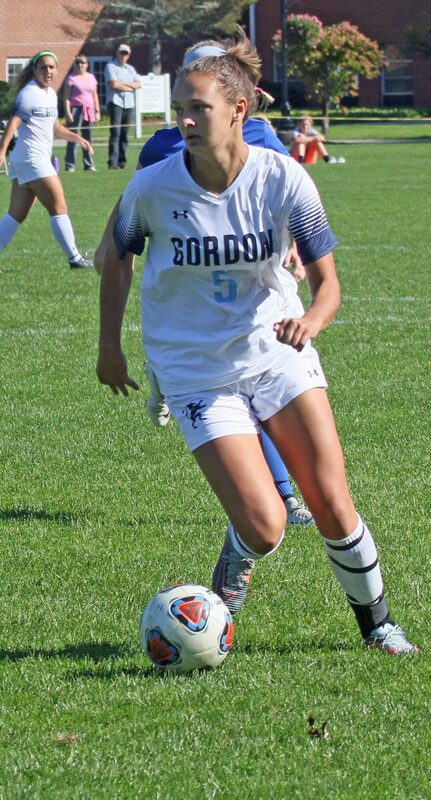 Lexi Potter’s goal deserved two assists. Why? 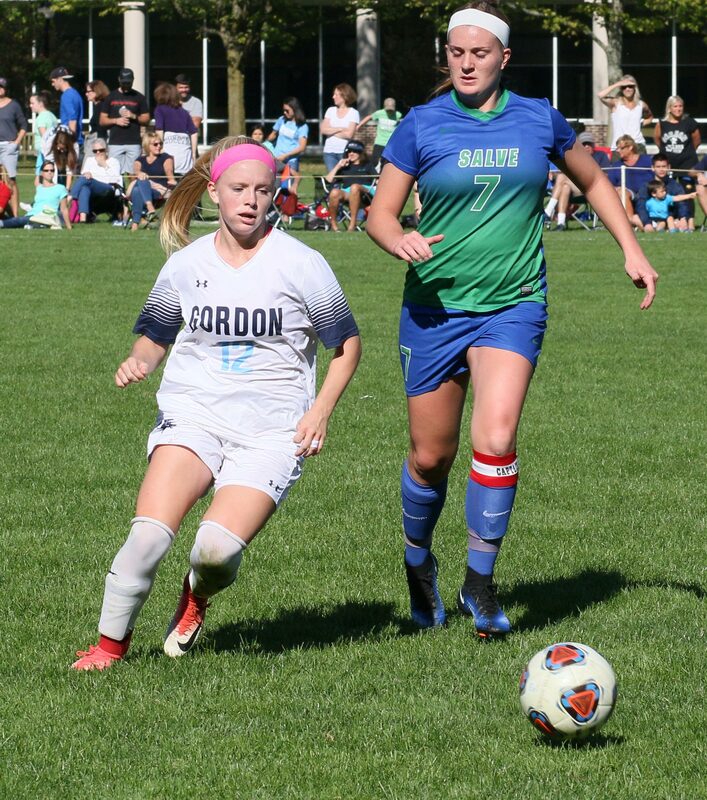 Sophomore Devin Lacroix advanced the ball forward beyond midfield in the middle and connected ahead to moving sophomore teammate Ashton Barkey. 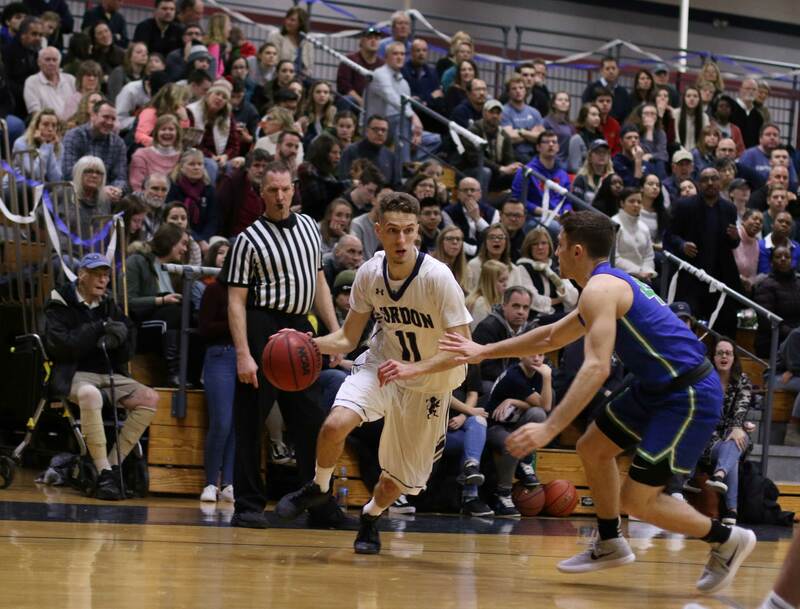 Ashton took a few dribbles forward and put a beautiful pass ahead beyond the Seahawks’ defenders. Lexi flew in from the right, past the defenders, collected the ball, and shot past SR goalie Carly Pala’s right and the celebrating began. As you can see, Devin (2nd team CCC last year) deserved an assist. 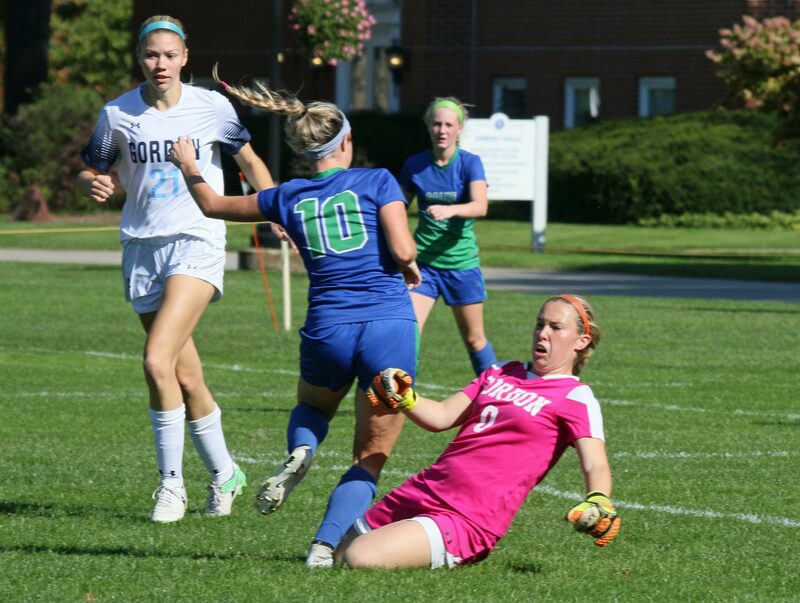 The biggest stop by Gordon’s sophomore goalie Kali Denty? A direct-kick blast late in the game from the middle of the field by Lea Adams. Kali, who isn’t very tall, took a high dive to her right to snag a shot headed for the upper corner. 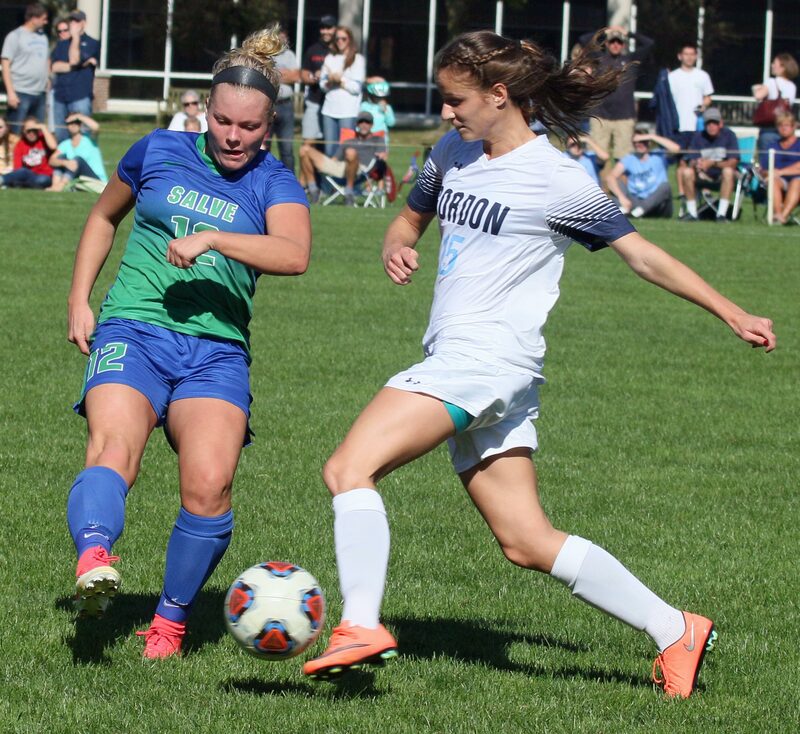 Abby McMackin (3rd team CCC last year) excelled for the Seahawks. I have pictures with her deep in both ends. She was relentless and had the best of SR’s scoring chances. Hard to single out anyone for the Scots because they were so unselfish with the ball. And it helped that there always seemed to be someone to pass to. The weather was truly remarkable. Seventies in late October? Good crowd on hand for the noon contest. Many, I suspect, were connected to the five seniors. 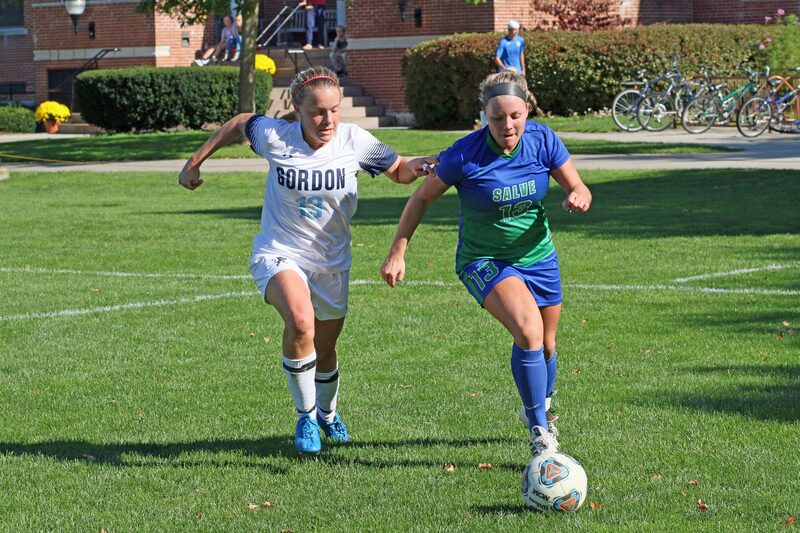 Gordon had a scoreless tie with Salve Regina last season at Newport. 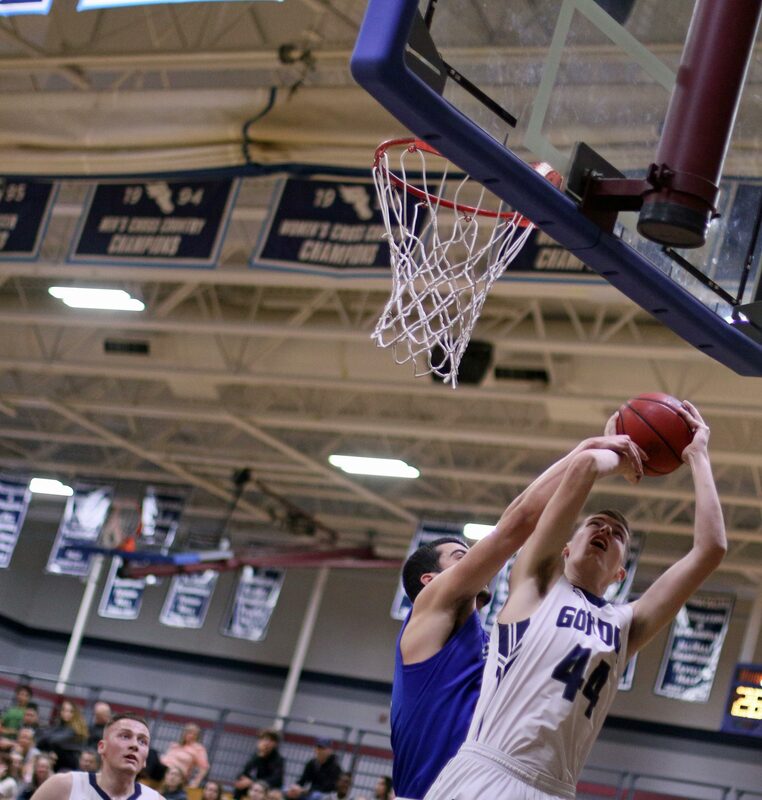 The Scots have reached the CCC tournament finals in each of the last two seasons. Maybe they can take the next step this year? 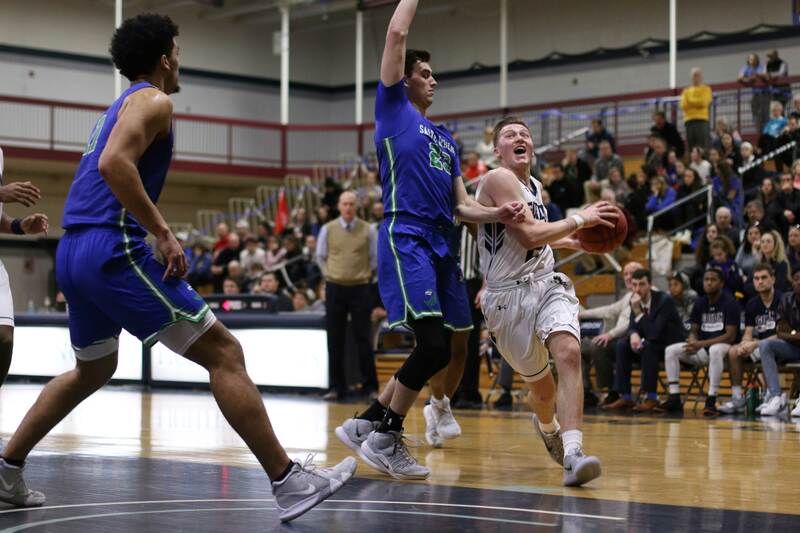 (Amesbury MA) The Scots finished the regular season with a 74-66 win over Salve Regina in Newport (RI) on Saturday afternoon. 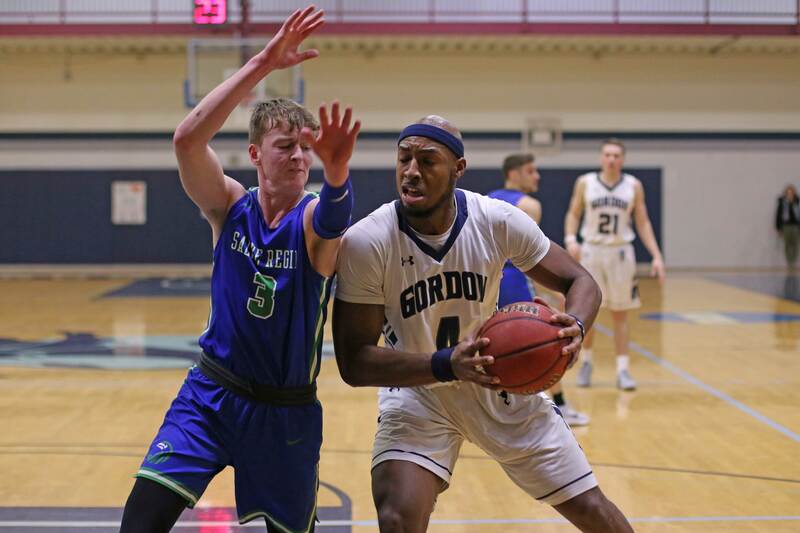 Gordon (15-10) needed the win to take fourth place in the Commonwealth Coast Conference and earn a home game (Tuesday 7PM) against Wentworth in the first round of the CCC tournament. The Scots are in the same bracket as top-seed Nichols and #8 UNE. 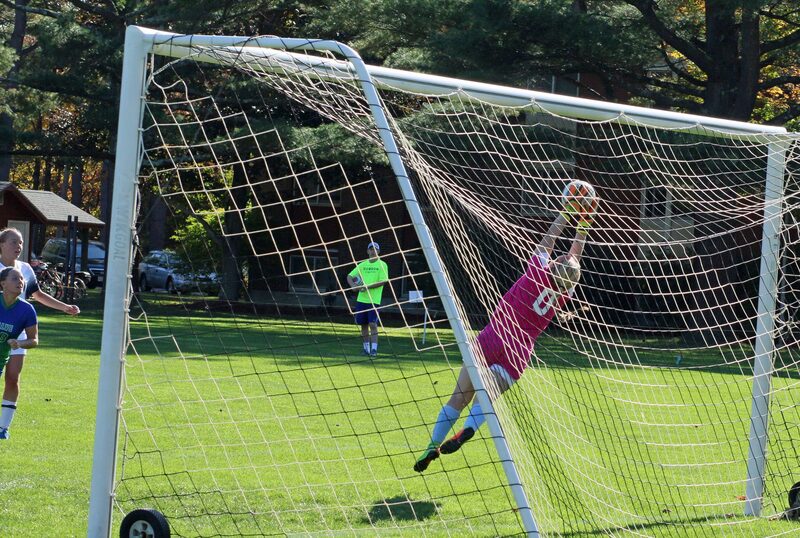 The Nor’Easters have upset higher seeded teams in the first round the last two post-seasons. Last year it was Wentworth and the year before it was Nichols. 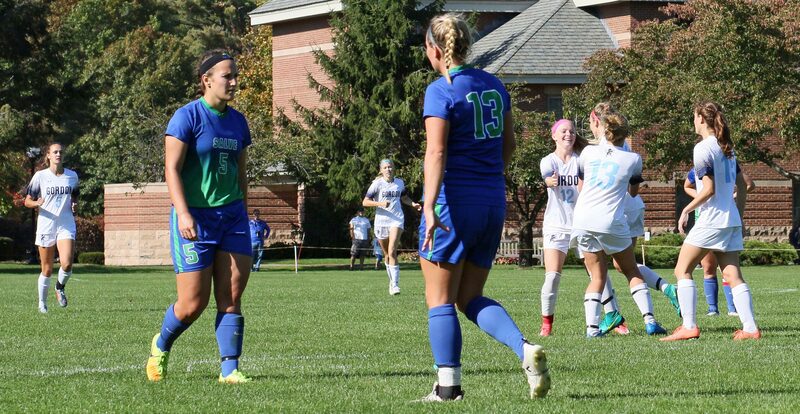 The game with Salve Regina (8-16) was close. The Seahawks trailed by just three points (61-58) with 4:21 to go. Gordon had done well inside all afternoon as nineteen second chance points and forty points in the paint suggests. 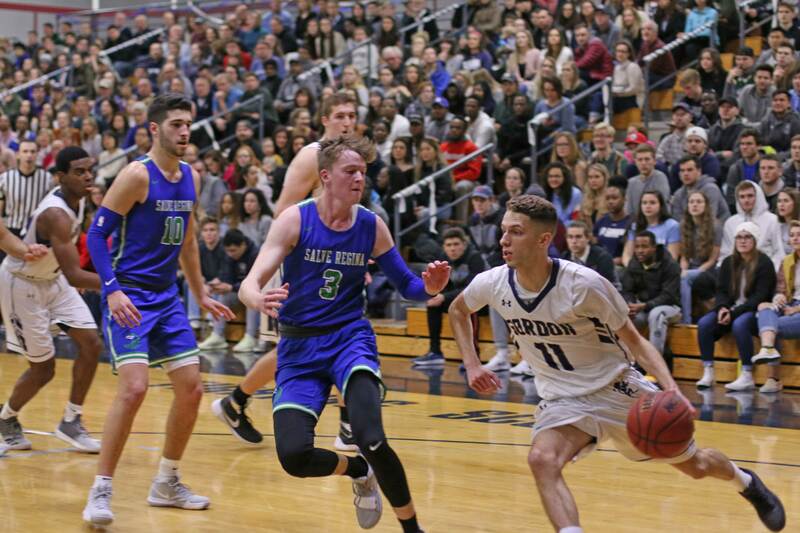 Consecutive layups by Garrisson Duvivier and Jaren Yang gained GC separation and five-of-six made free throws in the last minute finished off the team from Newport. 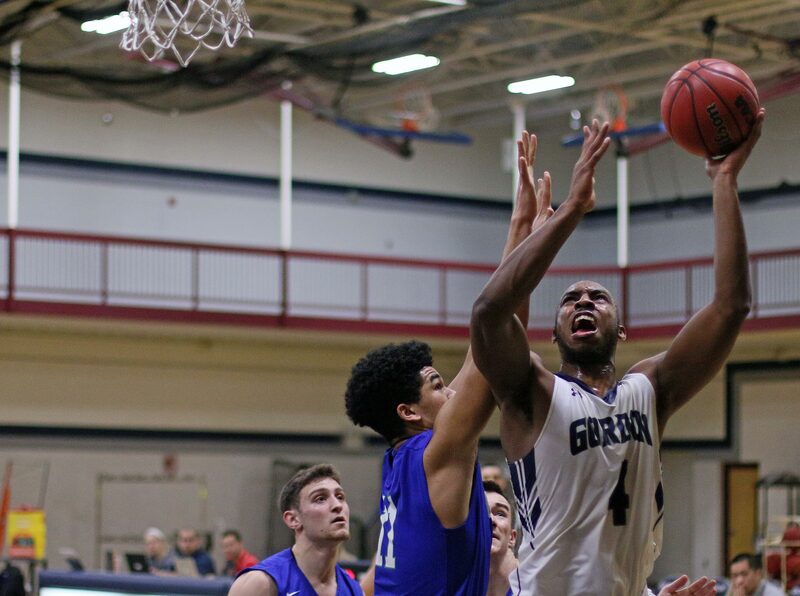 Garrisson was Garrisson – 26 points, 9 rebounds, and 4 steals. Sam Johnson was Sam Johnson – 13 points, and 16 rebounds. 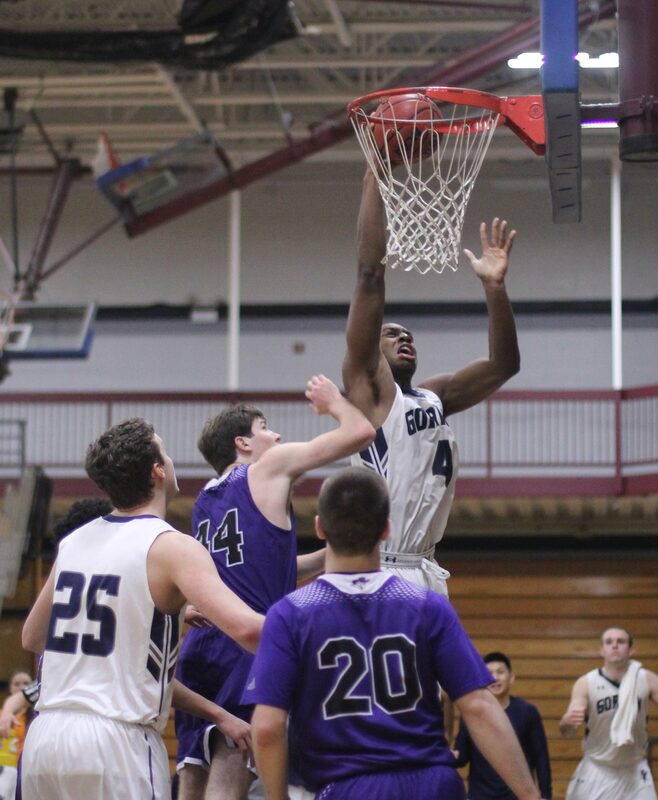 This was Sam’s sixteenth double/double of the season. 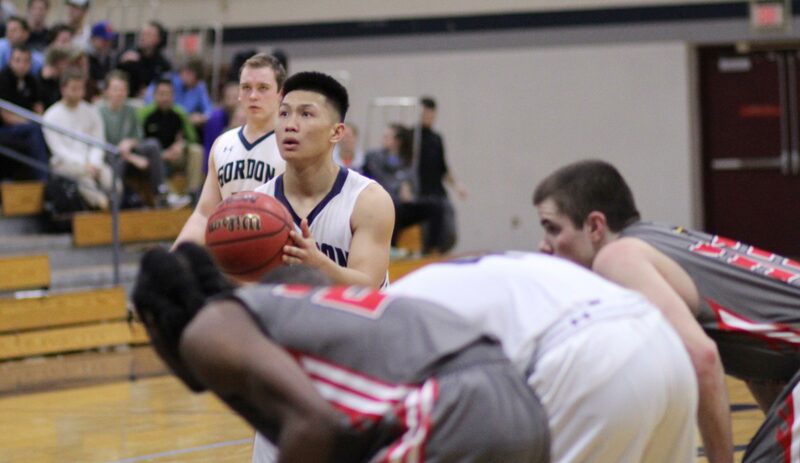 Jaren Yang had a marvelous second half – 13 points including 8-for-8 from the foul line. Those stats were wonderful but the one I liked the best was Gordon having only NINE turnovers. The last time that number was matched was during an NCAA post-season loss to Williams three years ago. 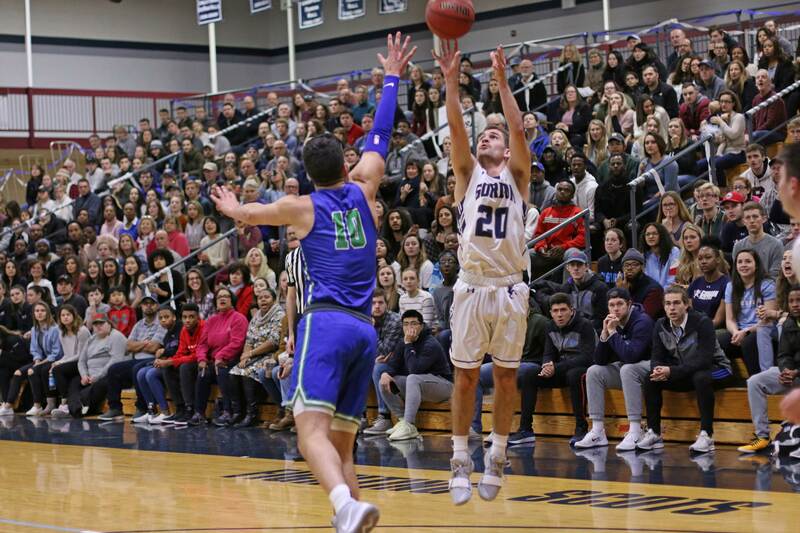 With few turnovers and a strong inside presence, the Scots could play three more games and be standing behind a banner. Jaren Yang was eight-for-eight at the line in the second half. 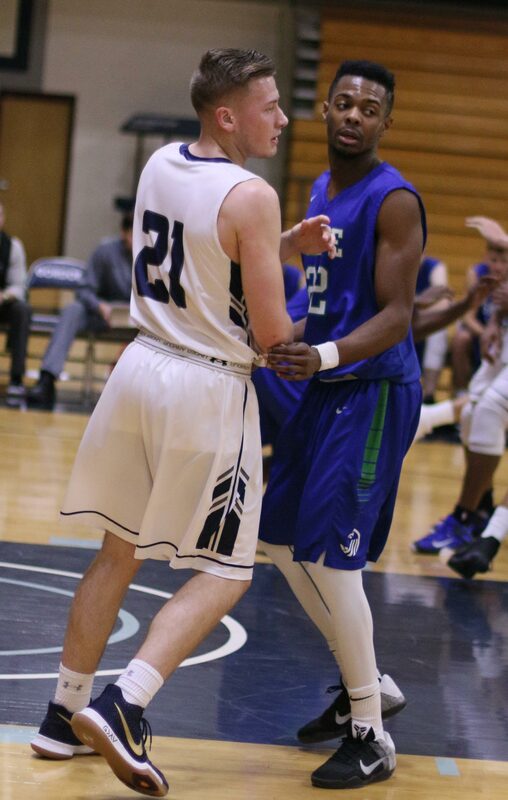 The Seahawks will face Endicott, at Endicott, on Tuesday night. Last meeting between those two resulted in a 35-point SR defeat. 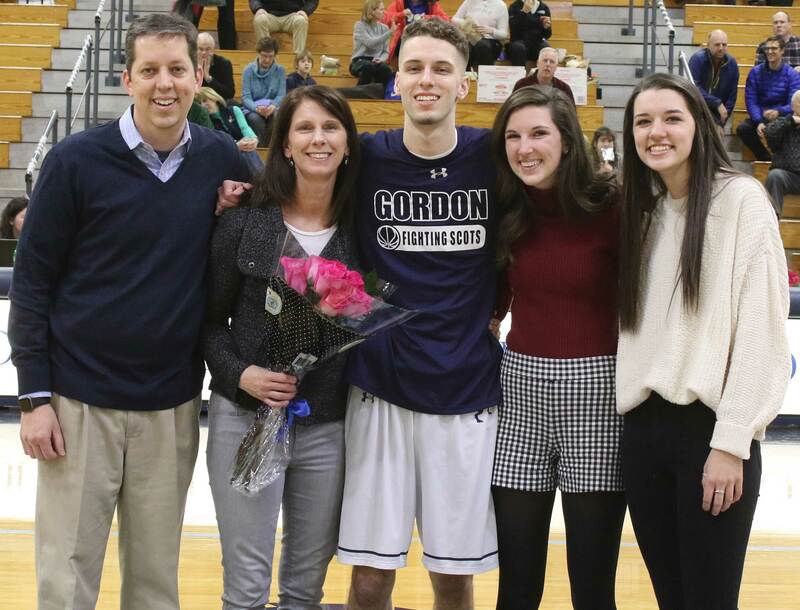 Gordon’s last-meeting win over Wentworth was hopefully a turning point in our relationship with the team from Boston. Tuesday night’s game should be a good one. Why is this so late? 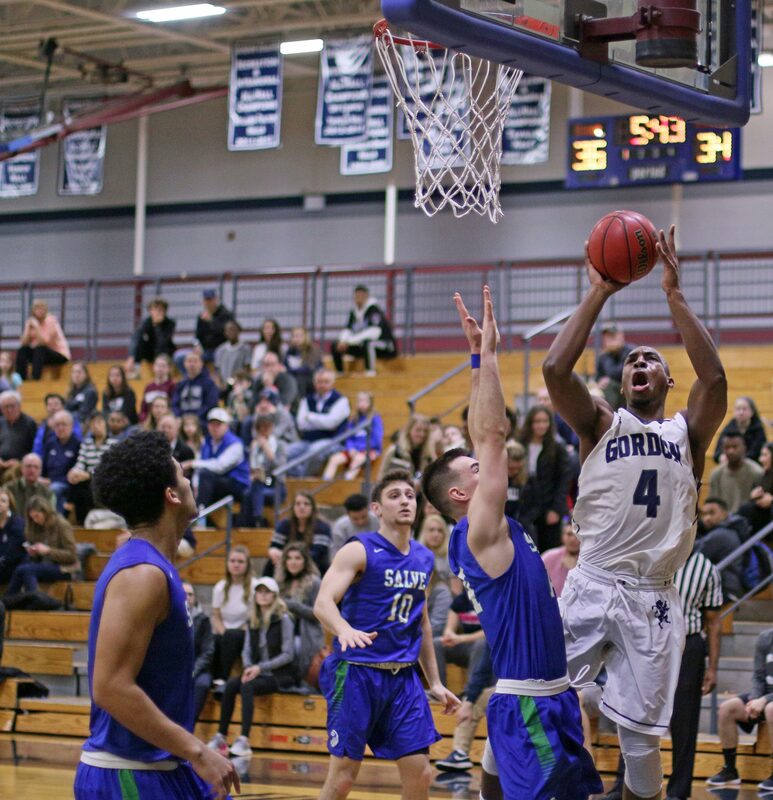 Saturday morning I learned that my nephew’s son was playing in a high school tournament game that afternoon in Augusta, Maine. Off I went with my equipment and gave the game coverage. In it my nephew’s son cashed two free throws in the final seconds to separate his team from the opposition.